Wow, I'd say the Oasis looks like a super neat set-up! My grandparents have a huge garden and sometimes share their bounty because our own city yard is pretty small and our soil is clay. Something like this could be the ticket to growing our own great veggies and keeping the wildlife at bay! The system looks like the mother of all raised bed gardens! Hmmm...I know right where I put one! 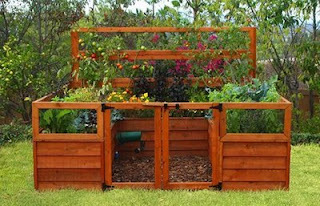 Enter to win the Oasis Garden at Resourceful Mommy.